Chicks are hatching everywhere and our first one, Pioneer, has been stepping out of his nest almost daily. Ships and sailing yachts are coming in and out of the bay… and it’s almost the middle of January! Where does time go? Michael was only on Goudier Island for a few hours before opening his tool boxes and starting to go through the maintenance job lists with his wife and conservation team partner Liesl. 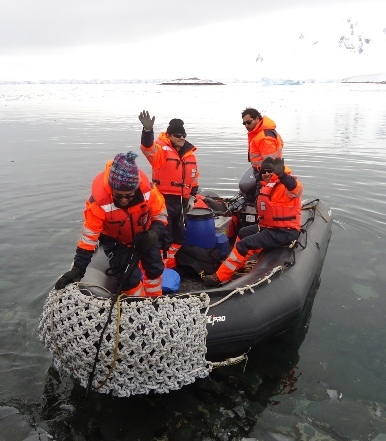 They prepared the mobile kit, wood, and paint, and on Sunday morning a zodiac from expedition ship Le Boreal transferred them to Damoy hut in Dorian Bay. The hut was in use from 1973 until 1993 and has been a historical monument since 2009. The conservation team will be staying there for about ten days – or until all tasks are completed. They have set up the communication system so we can keep in touch by radio when they are on top of the ridge and within range of the VHF, but also by email via the Iridium phone system. It feels like we have ‘new’ neighbours! Wednesday was a windless afternoon with no expedition ship in the bay so it was the perfect time to do our second penguin count of the season. We had counted the eggs on December 6th and found 613 nests. We lost a few nests since then as only 521 had chicks or eggs remaining. There can be many reasons for nests to fail; some nests (little volcano-like mounts of small stones) are not always well constructed and let snow and rain seep in, reducing the temperature inside and cooling the eggs. 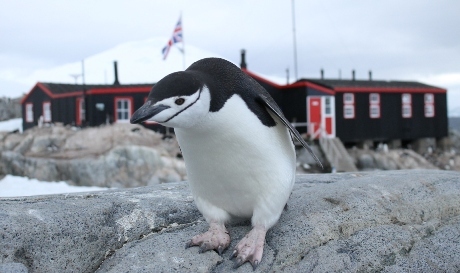 Eggs and small chicks are well sought after meals by skuas, giant petrels and snowy sheathbills, while adult penguins can be predated at sea by orcas and leopard seals (though the latter often prefer a young, tender, newly fledged chick). We found a remaining 282 eggs and an amazing 617 chicks on Goudier Island! We have a wide age range of chicks, with our first chicks Pioneer and Aka almost 3 weeks old and half the size of their parents already, whilst there are newly hatched chicks still with their white hard-tooth on the tip of their beaks (which is important for them to be able to break out of their shell). Most colonies include chicks of all sizes so we hope the older chicks will be able to form big enough crèches to defend themselves against predators when both parents have to go foraging at sea to be able to continue feeding them. 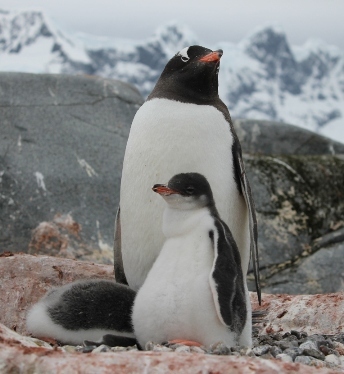 According to expedition staff, our gentoo chicks hatched earlier than in many places visited on the Peninsula. 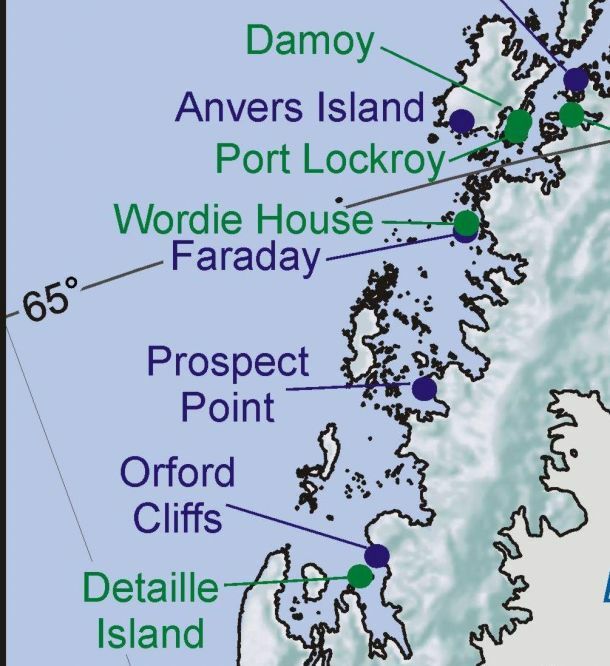 This could be because we have had little snow cover on the rookeries, hardly any ice in the bay, and very good food around, given the healthy pink guano surrounding the nests. We continue to have daily visits from chinstraps, Adélies and leopard seals, and ships have reported seeing Minke whales in the bay – krill must be very abundant to attract them all! The Argentinian Navy ship ARA Suboficial Castillo visited us on Friday. The Argentinian and Chilean Navy have a combined project to patrol the area and prevent pollution at sea. The Argentinian Navy has now completed its round of duty and will be back in Ushuaia by January 15th. It was a very friendly visit followed by group pictures outside Bransfield House, and we look forward to seeing the Chilean Navy in a few weeks. We have a good relationship with our closest Chilean neighbours at Yelcho station (Doumer Island). Yelcho station first opened in 1962 but hasn’t been used continuously since then. 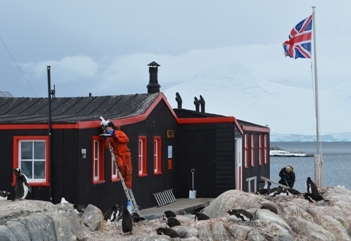 Starting last summer, the Chilean Navy and scientific program is restoring the huts and building new facilities to accommodate marine biologists in the future. We have had the chance to meet 4 of the 6 men working on base this season, we keep in touch using the radio and exchange gifts and greetings via sailing yachts! 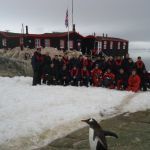 Port Lockroy is a busy neighbourhood with many visitors and plenty of locals. The next guests are on their way so it’s time for me to say goodbye and wish you a good week!